So, as with Mr Quango, there I am buying some bits before returning the the UK with my family after a short break. One thing I saw for sale and jumped at was 100W lightbulbs. In the 3rd world there is no EU regulation to stop the selling of Halogen bulbs and I guess there are still factories that churn them out. You see, CFL bulbs, which via EU law have now replaced Halogen's are just no good. They won't work for any outside lighting as they do not work in the cold, the small print tells you they take up to 1 hour to heat up and also you try finding a sparky who reckons they work with dimmer switches. Worst of all, unless handled with impeccable care, never switched on or off and also taken back to the supplier for recycling; they are no better than Halogens. This last point really sticks, there is a whole army of green bloggers in alliance with bulb makers who have bullied Governments into making changes for 'enviromental reasons', but these are often bogus. CFL's have better energy usage because, er, they produce less light. They have a longer lifetime by a factor of 10 for constant use and are 3 times as efficient only under those circumstances. Funnily, in my house they go about as often, if not more frequently that before. Especially if you touched them, which is a no-no apparently. But it is a great example of why we need to leave the EU and its corporatist enthralled allied to dim-thinking greenie-communism. Dim witted greenie-communists sums the other side up. The lighting we use in the warehouse is eco bulb. We have to have halogen motion bulbs too as it takes so long for the lights to illuminate. I replace all the 'lasts for ten year bulbs' at least once every 2 years. LED - the way forward. You can still get the old incandescent bulbs here; the writing on the packet says "not for domestic use" and that makes it OK by EU regulations. My automotive inspection lamp has incandescent bulbs. I buy lots of replacements for industrial purposes. Still, I suppose it's better than setting fire to your nightie with a candle! LED are... well... brilliant ! "The UK Parliament cannot abolish the tampon tax. The UK government lost a court case in the ECJ over keeping our VAT rate on green products at 5%. We have been ordered to raise the rate to 20%, making it much dearer to insulate our homes or fit heat pumps. We cannot take VAT off domestic fuel though that would ease pressures on family budgets and cut fuel poverty." We have the old incandescents everywhere: local hardware store sells them. "Not for domestic use". I read Mark Steyn on dealing with a breakage of the eco bulbs. Terrifying. Some people, I say some people, stocked up on incandescents long ago. I must say that the fluorescent bulb that we used outside, over the door, came free and lasted for perhaps fifteen years. So we replaced it with our second free bulb. The third one we hold in reserve. It'll see me out. Of course we won't use the filthy things indoors at all. Funny my bulbs seem to get disposed of quite well in the normal waste bin. I must have misplaced the instructional leaflet that came with the bulbs when I put them in the socket. Vile things, incandencents or LEDs all the way. - anyone concerned that the mercury content is dangerous is labelled as paranoid, but the instructions on disposal absolutely indicate otherwise - why would you ned to air the room for 10 - 15 min otherwise. Typical of the nothingto see here move along horseshit people are fed. Final point whyis this "greenie communism" when it's corporatist green washing with an added authoritarianism. Don't get hung up on the labels, its the fact that you are being dictated to is the issue. Agree with Sackerson, Tim, and all the LED fans. I can get incandescent bulbs in my local everything shop. I only use LEDs these days. LEDs used to be a horrible Daz White, but the manufacturers are getting better and better. Tesco do a good Osram range and Ikea's ones are good too. CFLs were an intermediate technology. I am lucky enough to have ditched all mine into the neighbouring council's facility across the road from Eyes Towers. LEDs are only for boats and other LV DC systems. It's all about colour. For many years I've been a keen amateur videographer and light colour and spectrum is critically important. Fluorescent and Eco lamps produce a sickly green puke-coloured malevolent light that makes everyone look ill and ugly. "Green" as my Ex's old stage-setting teacher used to say "is for witches". And LED light is too blue and cold - it lacks the UV end of the spectrum and peaks at all the wrong places. Even 'yellow' or 'warm' LEDs are the wrong colour. For years pubs and restaurants have screwed-up women's make up. The mirror lights in the ladies loos are usually bright fluorescent i.e. green and when make-up is adjusted in this light and then seen in reality by pinky-red incandescent and candle light, it looks completely different. There ought to be a building reg obliging restaurants to provide a selectable simulacrum of the actual restaurant light in the ladies. My actress Ex was particularly hot on this, particularly when I confirmed what she knew with a bit of science. Blue - You held the fort very well. A worthy member of the C@W team. Rushes dipped in goose fat do quite well, but there is a bit of a problem with the insurance cover. It's the gas lamps I miss! NOT - as a father I no longer get profoundly irritated by the rest of the family leaving the lights on. Modern (last 36 months)LEDs are fantastic. They have reduced my light based energy consumption by more than 80%. 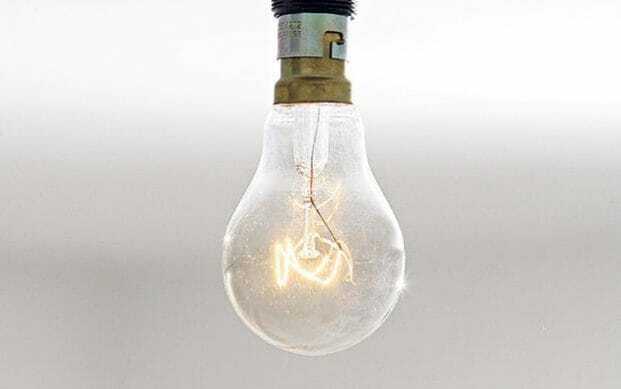 The light bulb ban is probably the greatest thing the EU will ever do (due to the world wide impact it will have on global warming - assuming you believe that global warming is happening). anon - my leds last about 5 weeks tops. I spend more than ever replacing the stupid things. God knows what pollution they cause on their mass disposal. The light bulb ban will have no effect on global warming. China and the emerging economies open 2 new coal stations per week. The dictatorship over bulbs is just one subject in many. For example, I have read that the EU are too ban the use of weed killers that contain glyphosate. If it's true then that leaves us with no proprietary weed killers as far as I know. Before it was banned I used sodium chlorate and it worked fast and effectively. I think it was the UN codex alimentarius that forced this on us, vis the EU. I wouldn't be surprised if the light bulb dictat also originated in the UN with the EU acting as their lackey. Quinoderm cannot be found anywhere, and then I realised that it contains peroxide - a component in making IEDs. Banned by the EU ? Well sort of. Their free movement policy has caused all sorts of problems that are never properly discussed. Ha, didn't know that hydrogen peroxide was banned. Could that explain UKIP's successes in the East of England? I think the incandescent bulb ban is a blunt instrument, but I don't buy the no effect argument either. European countries are at the prosperous end of the spectrum generally. If the whole continent becomes effectively an early adopter of greener tech then we are encouraging the investment in making it cheaper faster. So then we benefit from the next generation AND so does the rest of the world. I don't get the we are too small and insignificant to have an influence argument. The opposite argument is being made about trade deals etc post-Brexit. Are we an important country or not? You can't say we don't influence the lightbulb market and at the same time argue that the Indians will be gagging for a good deal once we leave the EU. CU I have no idea why you are getting through so many LEDs but, you are doing something wrong! No-one's saying we're too small or insignificant to have an effect. The EU is a judicial dictatorship, so it doesn't care how big we are. You've got to get the decent brands I've got megaman LEDs in kitchen and bathroom none of which (15) have gone. Would we have LED lights without CFL lights being pushed, creating demand for something better? And as to the argument raedwald says about colour, 99.99% of people don't care that much, new generation LED is good enough. And I've had some running for 8 hours a day for 5+ years. So don't say silly stuff about throwing them away all the time, just stop buying the cheap Chinese crap ones. Haha yes anon true - I'm amongst the 0.01% of ultra picky light colour faddists who won't even stay in a pub if the lighting is wrong .... and all I want is the freedom to make my choice and not to be dictated to as to which lamps I use in my own home.